Are you looking for a great way to stay in shape and build more muscle without the hassle of expensive gym memberships and crowded weight rooms? Turn any space into your own workout studio with this compact dynamic set of 5 different resistance loops plus 2 double sided sliders plus 1 exercise cord! Bicep curls, Push-ups, Band pull-aparts, Lateral band walks, Plank jacks, Lying glute bridges! ♦Resistance bands are made of 100% natural latex, they are stronger and able to stretch further. You will feel the same resistance after a dozen reps. These bands are free of non-natural Thermoplastic Elastomer and no rubber smell. ♦Resistance loops are comfortable, soft and easy on the skin. These bands are rigorously tested to be snap, stretch and sweat resistant. ♦For each exercise, you can choose 1 of 5 color-coded loop bands helping you no matter your level get the body you've always desired! How using the core sliders will help you? ♦Exercise Sliders are a low impact way to tighten your waistline and can be used to complement strength training, Crossfit and cross training workout routines. Our sliding discs produce results without putting strain on your body, so you can work out hard with much less risk of injury. ♦Use sliders on all surfaces.One side of our discs has a fabric surface to protect hard floors, while the other is smooth to slide on carpet. Find guide movies on YouTube and start your workout right now, shape your body, shape your new life! 【6 Resistance Loops & 2 Gliding Discs Fit Every Fitness Level】These professional home fitness equipment can be used alone or stacked in any combination. Perfect for popular workout programs like cross-fit, 80 day obsession by beach body, yoga, pilates, general exercises like stretching and strength training. 【Core Sliders & Work On Any Surface】Exercise sliders measure 7"x7"x0.4" with dual sides. The fabric side are use on hard wood, laminate and tiled floors, the smooth plastic layer use on carpets, rugs or cloth surface. Natural material more comfortable and safer for your hands and feet, and they're fun! 【Workout Anywhere & Anytime】Portable, lightweight and simple to use. They come with a drawstring bag so you can take bands and sliders with you for quick on-the-go workouts. 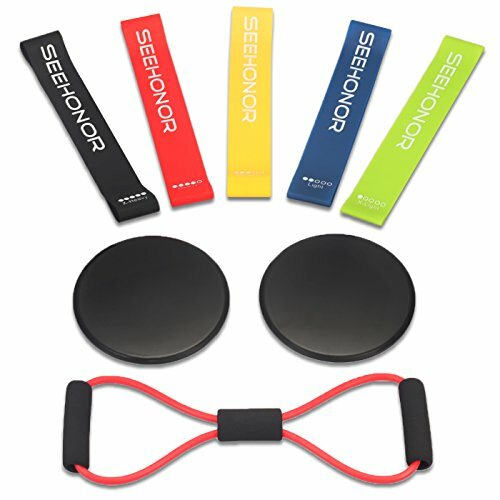 【Superior Quality & 100% Satisfaction Guarantee】We offer a 100% money back guarantee on all of our workout sliders and exercise bands.You can enjoy these bands and discs absolutely RISK-FREE. 【Workout Bands & 100% Natural Latex】Our 12″ by 2″ heavy duty resistance loop bands are made of environmental friendly natural latex - stronger and last longer. Resistance ranges from: X-Light (5-10 lbs), Light (10-15 lbs), Medium (15-20 lbs), Heavy (20-25 lbs), X-Heavy (25-30 lbs). Whether you're a beginner or an expert, these stretch bands are great for toning your glutes, abs, biceps, triceps, legs and knees, help in recovery. The eight shape exercise cord (10-15 lbs) is an additional gift.